PHOTO: Edna Mode is back in new character teaser poster for Pixar's "Incredibles 2"
Disney/Pixar‘s smash hit 2004 superhero adventure “The Incredibles” is mostly the story of a family with very special powers, but it’s also got some wonderful supporting characters. One of the funniest and most memorable of those characters is definitely Edna Mode, the eccentric fashion designer voiced by multi-talented “Incredibles” director Brad Bird. Inspired by legendary Oscar-winning costume designer Edith Head (with a pinch of James Bond’s gadget-supplier Q thrown in for good measure), Edna Mode famously– and hilariously– provides the Parr family with their supersuits in the popular animated feature. And now Edna is set to return in this summer’s “Incredibles 2” from Pixar. 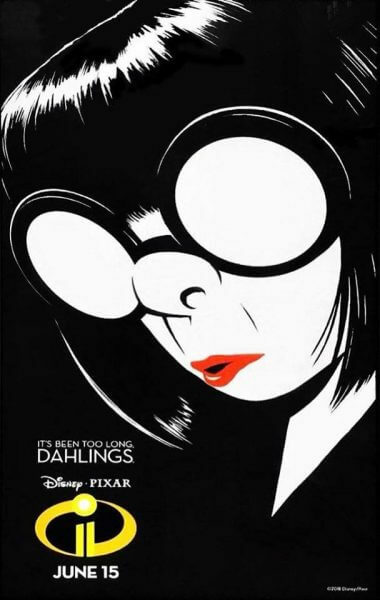 Disney fans started noticing this Edna Mode character teaser poster popping up in movie theaters and bus stops around the country, and it’s certainly helping to generate buzz for the upcoming sequel. “It’s been too long, dahlings” indeed. “Incredibles 2” is set to be released nationwide on Friday, June 15 from Disney/Pixar.